Enviar solicitação de disponibilidade com as datas desejadas para Hotel Brunelleschi. This contemporary room features 1 Queen or Twin bed with views of a bustling pedestrian street and courtyard, a 42-inch Satellite TV, minibar and luxury bed linen. This is a cozy Florence double bed room with a view over Giglio square and located in the inner courtyard of our hotel. All the bedrooms offer a minimum 21 sqm / 226 sqft in size and have been recently refurbished with renovated furniture and decoration. This deluxe room comes with two Twin beds or a King bed and faces Calzaiuoli street or picturesque Vicolo del Giglio. Features include a minibar, in room safe, air conditioning and high speed internet. 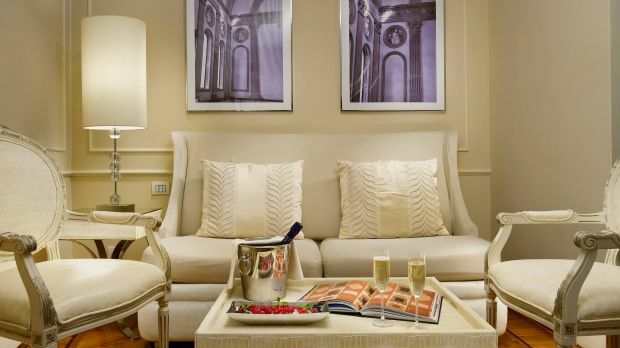 This luxury suite is designed for refined tourists and demanding business people who seek comfort and elegance. Recently renovated, it faces the well-known Calzaiuoli street, heart of the Florentine shopping district, and boasts a spectacular view of Piazza della Repubblica. Features include a comfortable canopy king-size bed and a large bathroom fully equipped with a bathtub, fluffy bathrobes. This deluxe room features two Twin beds or a King bed, Duomo views, minibar, Satellite TV, air conditioning and high speed internet. 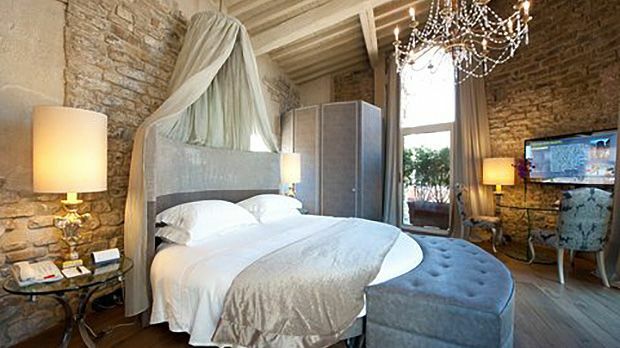 This gorgeous room features a 360 degree view of the Giotto Bell Tower, San Lorenzo Church and the Palazzo Vecchio. Inside, features include 1 King-size bed, minibar, Satellite TV and contemporary furnishings. Recently renovated and refurbished, this suite has an area of about 432 sqft. The suite can be provided with a comfortable four-poster bed of 79 x 79 in. or with two singles beds of 31 X 79 inches. The room has a 42″ LCD TV with digital channels, Sky, Wi-Fi and cable internet, direct telephone lines with voicemail, adjustable air conditioning and heating, and a safe to store a laptop. The wide bathroom has a whirlpool tub, in some cases with a separate shower, hairdryer, magnifying mirror, fluffy towels and toiletries by Dr Vranjes. The living room can be used as bedroom for maximum 2 children. 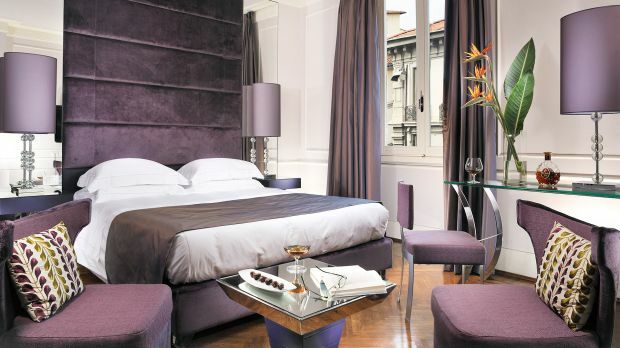 This suite in Florence features a whirlpool bathtub, King bed and oak parquet flooring. Fully refurbished by the renowned Architect Benelli, it also overlooks the pedestrian Via del Corso or the tiny square Del Giglio, right in the heart of Florence. The suite consists of a double room and a living room. The living room can be used as bedroom for maximum 2 children. 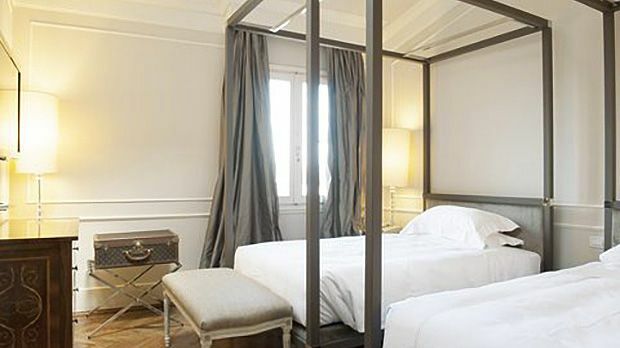 Suite with King Canopy Bed, facing the famous Santa Croce Square and Bargello, features a double room and living room, Satellite TV, minibar, air conditioning, in-room safe and spacious marble bathroom. 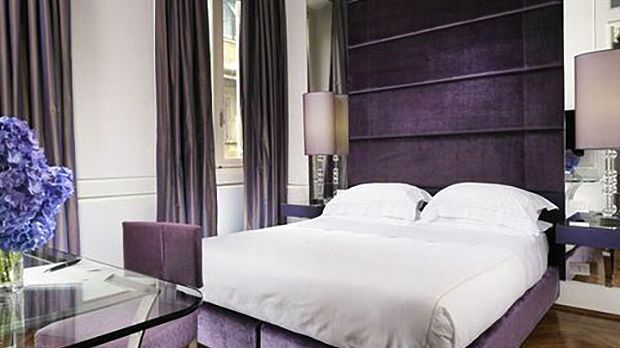 Suite with a King canopy bed, facing the beautiful Duomo and Giotto Tower, LCD TV, minbar, air conditioning, in-room safe and elegant furnishings. The Family room features either 2 King-size beds or 4 Twin-size beds, a spacious bathroom, 42-inch LCD Satellite TV and a coffee maker. Features a King canopy bed, jacuzzi, air conditioning, flat-screen TV, Wi-Fi Internet, views of the city, Palazzo Vecchio and Duomo. This suite features 1 King bed, jacuzzi, terrace, Duomo view, Nespresso machine and a welcome fruit basket with Tuscan wine. The two-bedroom Suite in Florence with a whirlpool bath is composed of two spacious interconnecting suites of 45 sq mt. / 484 sq ft. each (a total of 90 sqmt / 968 sqft). Fully refurbished by the renowned Architect Benelli, this designer suite overlooks the pedestrian Via del Corso or the tiny square Del Giglio, right in the heart of Florence. Features include 2 King beds, sofa bed, spacious marble bathroom and a courtesy kit by Maison Dr Vranjes with ‘soft touch’ bottles. Located in a Byzantine tower, this suite features a jacuzzi, iPod docking station, DVD player, fruit basket, Tuscan wine, luxurious bed linen and a Nespresso machine. The luxurious Penthouse Apartment boasts 2 Queen beds, 1 King bed and 2 Round beds, flat-screen TV, air conditioning, Jacuzzi, complimentary WiFi, marble bathroom, minibar and a spacious marble bathroom.